Sony's newest home theater projector, the BRAVIA VPL-VW40, has a lot going for it. 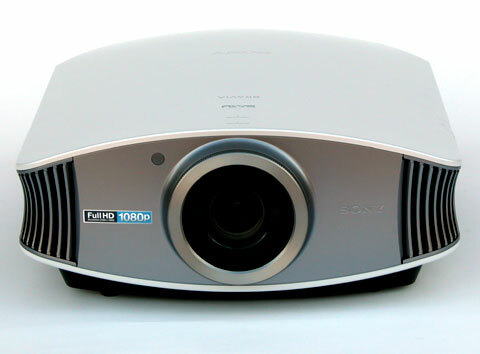 This 1080p projector uses Sony's SXRD technology (a version of LCOS), which has proven itself as a solid performer over the years. More important, it marks the first time a 1080p LCOS home theater projector has broken the $3,000 price barrier. With superb contrast and a razor-sharp image, the VW40 is a great choice for dark room home theater. High in contrast. The VPL-VW40 has several features which boost contrast, from an auto iris to gamma adjustments to a "Black level adjust" control which can make blacks blacker, though it does sacrifice some shadow detail in the extreme low end. Overall, the projector offers excellent dynamic range which is only really taken advantage of in a pitch dark room. Razor sharp, crystal clear image. Details in HD material can be clearly seen in the VW40's image, such as an actor's pores in close-up or individual hairs in a beard. It is easy to spot textures in fabric or on buildings, as each individual characteristic is displayed in pristine, lifelike detail. The only downside is that this extreme sharpness tends to make the image appear more "digital" than some of the competition, which looks much more film-like in comparison. No visible pixelation. Some projectors, such as the Panasonic PT-AE2000, have no discernible pixel structure. The VW40 has a pixel structure that you can see with the naked eye, but it is incredibly subtle - if you are anything more than a few inches from the screen, it disappears. The end result is that images appear pixel-free and smooth as silk. Long, powered zoom/focus. Incidentally, the visible pixel structure makes the VW40's powered zoom/focus easier to use. Standing near the screen, you can clearly see when the projector is in perfect focus, yet pixelation disappears as soon as you step back. The focus itself is simple to use: hold down the button to adjust quickly, and tap it to adjust slowly. The same goes for the VW40's 1.7:1 zoom, which can display a 100" diagonal 16:9 image from 10'2" to 17'6". That's plenty of leeway to adjust the projector to your room. Two picture height lens shift. The VW40 has a vertical lens shift range of two screen heights, so the image can be placed completely above or completely below the lens centerline. Coupled with the long zoom lens, this makes the VW40 ideal for a rear shelf mount. Good remote, clear and concise menus. Normally something we take for granted, the VW40's remote has excellent range and responsiveness. This is vital in rear shelf installations, since the projector can be several feet behind the audience. This means the remote signal must bouce off the screen in the front of the room and then come all the way back - or the user must turn around completely. The VW40's remote control has sufficient range to overcome this potential problem. The menus, like those on the VW60, are clean and logically organized with a shallow learning curve. Low fan noise, little heat exhaust. The VW40 uses the same 200W UHP lamp as the older VW60. When standing more than a few feet away, the VW40 is completely silent - even in high lamp mode. Heat exhaust is likewise minimal, and is expelled out through the front of the case, using one of the vents beside the lens. Both of these features should make the VW40 more adaptable to projection in a small room.